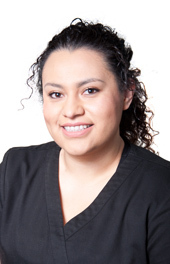 Rosaura Reyes is a registered dental hygienist at La Clinica’s Central Point Health Center. Rosaura, who goes by Rosa, earned her associate degree in dental hygiene from Carrington College in Boise, Idaho, and worked at both private dental offices and Siskiyou Community Health Center in Grants Pass before coming to La Clinica in 2014. Born in Ashland, she grew up in Medford and now lives in Central Point. Her family owns a small business in Phoenix, and she enjoys hiking and spending time with her nephew and her two Chihuahuas, Mona and Jerry. She also has enjoyed providing dental education and treatment at area schools. Rosaura was excited about the opportunity to contribute to the community through La Clinica.